Students at Emory University protested outside of the administration office, complaining that they were “afraid” and “in pain” from campaign messages supporting Donald Trump written in chalk. I’m supposed to feel comfortable and safe [here]. But this man is being supported by students on our campus. Chalk messages like “Trump 2016,” “Vote Trump,” and simply “Trump,” scrawled on the concrete and sometimes on the stairs, have made students feel unsafe, according to the protesters. Some of the students demanded that the college administrators send a campus-wide email denouncing the “fascist, racist” Donald Trump, which Emory president James Wagner refused to do. “You are not listening! Come speak to us, we are in pain!” the students shouted in an antiphonal chant outside of the administration building on Tuesday. 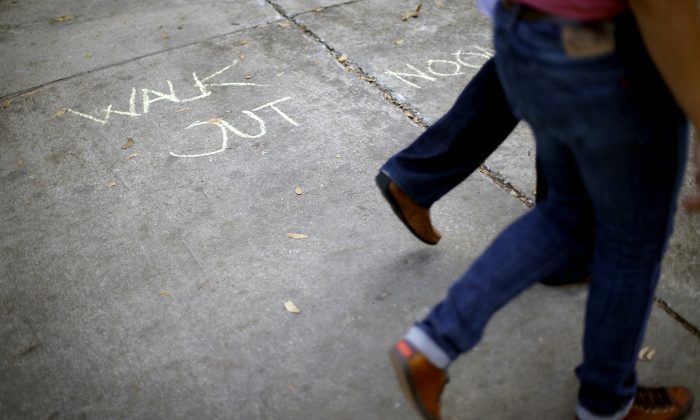 Wagner said that the university will review security footage and try to identify the people who wrote the chalk messages, disciplining them with the conduct violation process if they’re students, and pressing trespassing charges if they’re outsiders.